There are several babycare units throughout the terminal and can be found in the following locations. Before the security section, located opposite WHSmiths. Near Gate 5 after security. Between gates 11 and 12 in the Baby changing room. After the security section next to the available toilet in the upper Departure Lounge. Before the security section, adjacent to Granite City Bar. WHSmith and World Duty free offers a range of games and books suitable for children. A play area can be found adjacent to Gate 1, as well as a selection of toys at Gate 10 to keep your children occupied! Our friends at Airport Parking Shop have produced a brilliant collection of detailed content regarding the topic of travelling with children. The information ranges from tips and tricks on how to keep them entertained, through to what’s meant by an Unaccompanied Minor. If you have an imminent journey with children, be sure to check out the content below! Unaccompanied Minors – A great article which details handy info on tips before you book, using airport services, and the typical prices for children travelling alone. Flying with babies and toddlers – A breakdown for parents describing what liquids to take, airline guidelines, what food to pack, how to keep them entertained and much more! Breast feeding at airports – What facilities are available at UK airports and what the airports had to say on the matter. 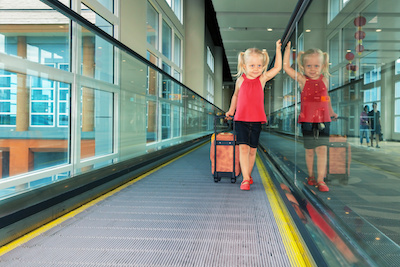 How to keep the children entertained on long journeys – An insight into Airport Parking Shop’s top ten tips for keeping the little ones entertained over long journeys. UK airports need to step up their assistance for those with autism – A very informative article highlighting important factors to consider when travelling with someone who suffers from autism as well as top tips for making your journey run smoothly. To ensure you comply with UK regulations when hiring a car with children please read the Department for Transport website for more details on child seat laws in the UK.